When the Patterson daughters return home to Meadow Brook to be with their father after their mother’s death, they bring with them a world of complication and trouble. The eldest sister, obstetrician Madeleine, would rather be anywhere but her hometown, violinist Abigail has fled from her stellar career, while teacher Lucinda is struggling to have the children she and her husband so desperately want. The black sheep of the family, Charlie, feels her life as a barista and exercise instructor doesn’t measure up to that of her gifted and successful sisters. Dealing with their bereft father who is determined to sell the family motel, their loves old and new and a series of troublesome decisions doesn’t make life any easier, but when they go through their mother’s possessions and uncover the shocking secret of an old family curse, they begin to question everything they thought they knew. Rachael Johns usually writes Rural Romance, a genre I read from time to time, but this is the first of her novels I’ve actually read. The Patterson girls are reunited at Christmas in their home town of Meadow Brook in South Australia. They are their to help their father who is grieving the loss of their mother and struggling with running the family motel. It is here that the four sisters uncover a curse bestowed upon the family generations before. The sisters then part to return to their lives, or start new ones with the curse running through their minds and affecting their decisions. The story does drag a little in the middle, but that’s because we are given four characters to follow. For most of them, the curse weighs on their minds and they react in ways that aren’t entirely rational. Madeleine is the oldest Patterson Girl, a driven obstetrician who has chosen the wrong man to love. Lucinda’s desperation to have a child is almost spot on and absolutely depressing as a result. Charlie is the hippy vegetarian, the odd one out. She was my favourite character because she was the most down to earth and I related most closely to her. Abigail is the youngest and makes silly mistakes throughout the novel. I liked Abigail as a character, but I did feel she came off as a little too ditzy at times to be believable. The secondary characters helped reveal who the Patterson girls really were. Mitch was by far my favourite, although almost too good to be true. Aunty Mags was great and a nice change from the other characters. I was a little disappointed the girls Dad didn’t feature very much, given they were supposed to be there to support him. He makes flittering appearances but always has to duck off to the motel or to bed because he’s tired. Each of the four girls has a love interest, and not always the right one. The writing was solid, although there were a few cliched lines that repeated throughout that I associate only with romance novels and occasionally pulled me out of the story. This probably wouldn’t bother a lot of people, but it’s something I’ve begun noticing a little more lately. 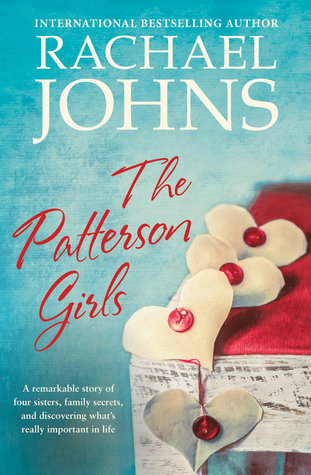 Although a longish book, The Patterson Girls was a fun read. If you like romance and women’s fiction (chick-lit) then you’d probably enjoy it.